“What I needed was preaching that would convict me of sin and make me see my need, and bring me to repentance and tell me something about regeneration. But I never heard that. The preaching we had was always based on the assumption that we were all Christians, that we would not have been there in the congregation unless we were Christians”. In actual fact his journey to true faith had started years earlier when he was at boarding school and his history teacher had given him a book about Howell Harris, an influential figure of the Welsh revival. This was Lloyd-Jones’ introduction to Calvinistic Methodist history and it caused him to begin studying the scriptures intently. It was at age 17 that he came to understand and believe (based on scripture) in the doctrine of predestination and the absolute sovereignty of God. One of the reasons Lloyd-Jones’ life resonates with me so much is that I see a lot of myself in his story, especially in these early years (though I am no medical student). Don’t get me wrong, I grew up in a church with mostly very solid Biblical teaching and I do recall several sermons in the 1990s that convicted me of sin at a young age and made me take God more seriously. Indeed it was around this time that I made my first profession of faith after realising the reality of heaven and hell and my need (as a sinner) for a Saviour. However I’d say that, as is the case in many western churches still today, the tendency can often be after a period of strong gospel preaching and exposition to resort back to topical preaching rather than Biblical exposition. I believe topical preaching is more palatable to the masses, but all things considered – accurate exposition of scripture is more powerful in light of eternity. For this reason in my high school and University years I still saw Christianity as a sort of box that I’d checked and though I was involved in church, it wasn’t really fully alive to me Monday through Saturday. Again, similarly to Lloyd-Jones’ experience it was when I came to understand the Calvinistic teaching on the ‘doctrines of grace’ and to see the truths of total depravity, unconditional election, limited atonement, irresistible grace and perseverance of the saints taught clearly in scripture that God drew me to himself in a way I hadn’t experienced before, giving me a heart that lives to love the God who is sovereign over all things and who saved me by His grace and called me to Himself, rather than waiting for me to turn to Him as a result of my ‘spiritual intelligence’. a desire to and an example set in how to finish well and to prepare for the end of his life in a way that continued to glorify God, despite earthly circumstances and sicknesses that plagued his body in the final years of his life on this earth. Of course much more could be said by expanding on each of these points, but I honestly would prefer to point you to this excellent book instead. 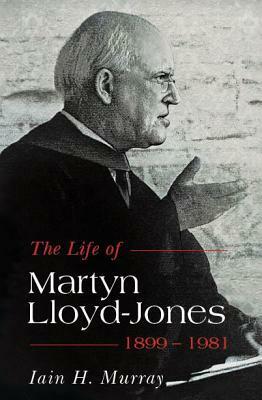 For 30 years Martyn Lloyd-Jones (aka “The Doctor”) ministered at London’s Westminster Chapel (after his initial parish position in Wales) and for three of those years Iain Murray, who authored this biography, was MLJ’s assistant. Murray’s love of and respect for ‘The Doctor’ is clear throughout the book, but what is also clear is that both Murray and MLJ were concerned not with making much of MLJ for the sake of earthly fame, but with giving glory to the God MLJ served as it was His work in MLJ’s life that made it worth reading about. His story has inspired me in many ways and as I said, I’m sure I don’t yet know the full extent of what this inspiration means or what it will lead to in my own life, but I do know this; I am thankful to God for raising up such a strong voice for truth – an exceptional expositor of the gospel in the 20th Century, and for making it possible for myself and many others to be introduced to his life and preaching through this book. For more information on Martyn Lloyd-Jones, visit mljtrust.org – a website which not only contains information about Dr Lloyd-Jones, but also contains links to over 1600 of his sermons which are all available for free (including his major series on Romans and Ephesians). For more books by Iain Murray as well as books by the Puritan writers and other trusted sources, visit Banner of Truth and check out their online store. I also recommend checking out Westminster Chapel and downloading their sermon podcasts as Greg Haslam, the current minister there, is also a gifted preacher like his predecessors (MLJ & R.T. Kendall). Recently, production house Media Gratiae has released an excellent documentary film about MLJ’s life and ministry, which I hope to watch and perhaps write about soon. It is entitled Logic on Fire, which is what MLJ said was the essence of preaching. Lloyd Jones’ life itself was a ‘life on fire’ – one that I believe my own life and many others have been warmed by and whose message sparks its hearers into action. The trailer for Logic on Fire is linked below. I’d encourage you to check that out too and purchase a copy of the film today (as well as a copy of Iain Murray’s book)! I trust you will be blessed by both! ← Easter Sunday: after darkness… light!